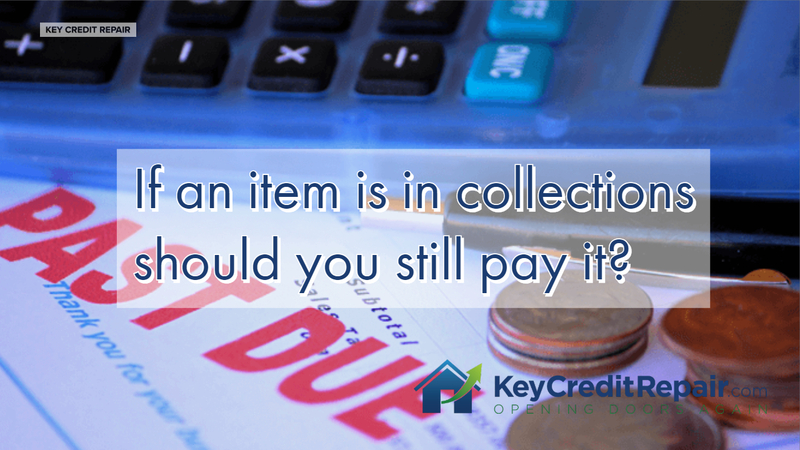 Home / Credit Repair Blog / If an item is in collections should you still pay it? 00:01 What’s up, guys? This is Nik Tsoukales with Key Credit Repair. Um, we posted an awesome raffle this week just asking you to post your questions, so one lucky winner this week is going to get a $250 American Express gift card and all you have to do is post your question, so please continue. 00:16 So, one of our questions that we got from Teresa Walker-Woodroth, and excuse me as I’m reading off my screen is, “If an item is in collections, should you still pay it?” So, let’s actually peel the onion back just a little bit more. If it’s something that’s questionable, if it’s something that’s old, if it’s something that’s past the statutes of limitations, which could be anywhere between 10 or as low as, uh, uh, three years in the state that you live in, you might not want to. You might want to challenge the record. You might want to request validation of the record to ensure if you’re gonna pay it, you’re paying off the right person, you’re paying the right amount, uh, and really that it’s just not an invalid debt. 00:55 Also, if the debt does come back as validated, keep in mind that if it’s with a debt collection agency and the debt collection agency is doing all the right things and you do want to pay it, it doesn’t mean you can’t negotiate a settlement. So, let’s say the, the, the collection agency has bought the debt for ten cents on the dollar, there’s nothing that stops you from offering them twenty cents on the dollar. They still make a little money and you get a discount. You can get a lot of the junk fees waived off of the collection amount. Um, and you can get rid of the debt. Now keep in mind, paying off the collection doesn’t necessarily remove the record. In fact, most of the time, it does not remove the record. But it’s still a step in the right direction if you feel like the debt is a valid. If you want to work on removing the record post paying it, then it’s something we can have a conversation about. 01:41 Thanks, guys. Nik Tsoukales with Key Credit Repair. Again, thank you to Teresa Walker-Woodroth for posting this awesome question. Have a great day.